In order to overcome the disadvantages of traditional wet chemistry approach, this study was targeted at using Fourier transform (FT)-near infrared (NIR) spectroscopic techniques to fast analyze the biomass chemical properties. Cornstover and switchgrass were two major biomass materials investigated in this study. Carbohydrates, in terms of glucose, xylose, galactose, arabinose, mannose, are of great interest to ethanol production. 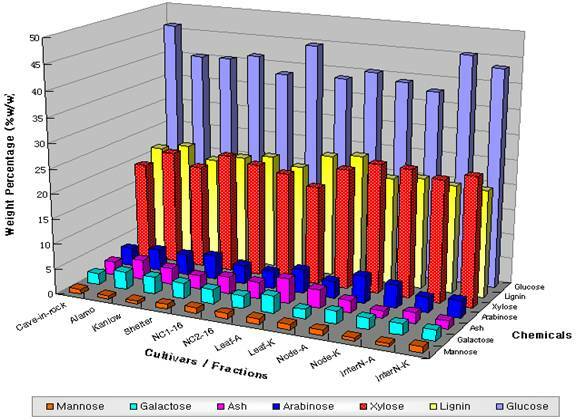 Lignin is important to bio-power industry, and ash is associated with the slagging problem. Therefore, these seven chemical constituents were focused on and models for predicting these constituents based on FT-NIR spectra were developed. Analyses showed that cornstover had more chemical variability than switchgrass and there was great variability among the botanic parts especially for cornstover. There was a trend, for both switchgrass and cornstover, that internodal parts had higher glucose content than nodes and leaves, and leaves had higher lignin and ash content than other parts. Also among different botanic parts of cornstover, husk had the highest total sugar content. Among the six switchgrass cultivars, Cave-in-rock had the highest glucose content and followed by NC2-16, while NC1-16 had the lowest glucose content.